Dear Editor: Should Writers Capitalize Deity Pronouns? Do we capitalize personal pronouns when referring to God? This question came up in one of the (many) Facebook reader and writer groups of which I’m a member. My initial reaction was that it’s a yes/no question, so there has to be a “right” answer. I was taught in school that we capitalize pronouns such as He, His, Him, and Your when referring to God. I was also taught that we use double quotation marks for speech (still true), single quotation marks for speech (now considered dated), and to add a comma where I’d add a pause if reading aloud (a topic probably best left for another blog post). The group’s answers ranged across the spectrum: yes, always. No, never. Sometimes. It depends. So I checked my collection of style guides. The Chicago Manual of Style is one of the two most commonly used style guides. As a broad generalization, CMOS is more commonly used for fiction, and The Associated Press Stylebook (AP) is more common in journalism. The Christian Writer’s Manual of Style says we don’t capitalize as a way to show respect or honor (despite popular belief). After all, we capitalize both God and Satan, yet only one deserves our honor. CMOS also points out there is no true historical precedent for capitalizing. William Tyndale (translator of one of the earliest English Bibles) didn’t consistently capitalize God, let alone He or Him (or he or him). Neither Hebrew nor Greek distinguishes between lowercase and capital letters the way English does, so the original Scriptures provide no guidance. That’s worth thinking about—no one wants their work to be considered dated or irrelevant. It’s a solid argument for using lowercase for deity pronouns and advising our clients to do the same. However, the decision does remain with the author (or publisher). As editors, the most important factor in any decision is consistency: we can refer to Jesus as He or he, Him or him, but we must choose one and apply that style choice consistently. Neither He nor he is incorrect but avoid using both. What do you think? 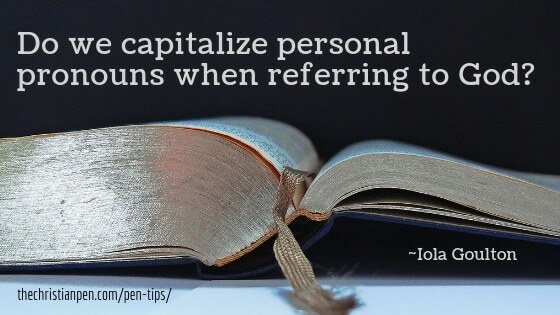 Do you capitalize pronouns referring to God or Jesus? Why or why not? Dear Editor: How Do I Find a Literary Agent? I often find my clients asking questions that go beyond editing or proofreading, and I know I’m not the only one hearing these questions. Today I’m going to offer my answer to a common query. I hope my answer will help if you’re asked a similar question. Authors who want to be published by a traditional publisher will almost certainly need a literary agent. Most large publishers do not accept any unsolicited manuscript submissions—all submissions must be from literary agents. Many small presses also require or prefer agented submissions. • Has a track record of selling manuscripts to CBA publishers. The Christian Writers Market Guide was established in 1985 by Sally Stuart, and is now published by The Christian Writers Institute (which is owned by literary agent Steve Laube). The guide is published annually, and is available in paperback and e-book, and as an online subscription. Michael Hyatt has a list of literary agents who represent Christian authors available from his website. You’ll have to sign up to his mailing list to receive it, but you can unsubscribe. Note that the list isn’t completely up to date. Check the copyright and acknowledgements pages of books in your genre. Many publishers include the agent’s name on the copyright page, and most authors thank their agent on the acknowledgements page. 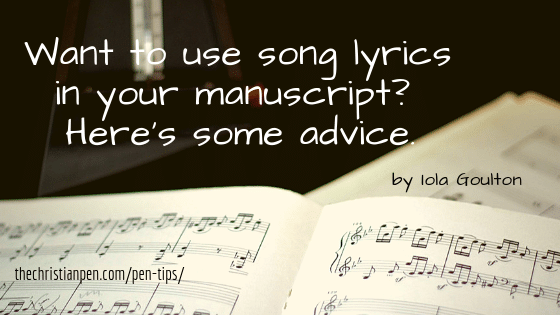 This will give you an idea of which agents sell manuscripts in your genre. If your dream is to be published by Bethany House, you want an agent who has previously sold manuscripts to Bethany House, and has a good working relationship with the acquisitions editors at Bethany House. You don’t want an agent who has only sold to small publishers, to digital-first or digital-only publishers, or to publishers who don’t require an agent. Check out new books from your dream publisher and see which agents made those sales. Many agents attend Christian Writer’s Conferences (e.g. American Christian Fiction Writers, Mt. Hermon Christian Writers Conference, Blue Ridge Mountains Christian Writing Conference). The Christian Writers Guide includes a list of conferences. Check out which conferences are near you, and which agents attend. 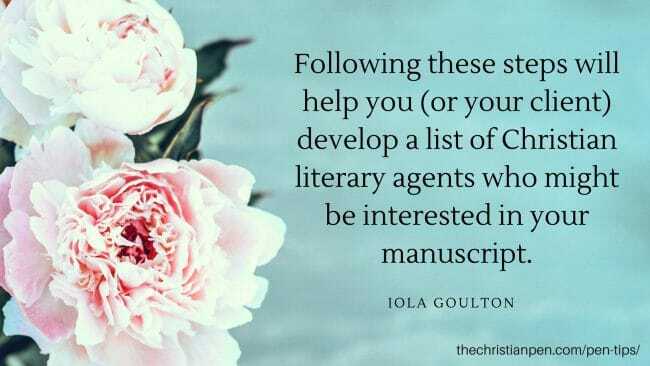 Following these steps will help you (or your client) develop a list of Christian literary agents who might be interested in your manuscript. Finding an agent is only the first step, but it’s an important step. 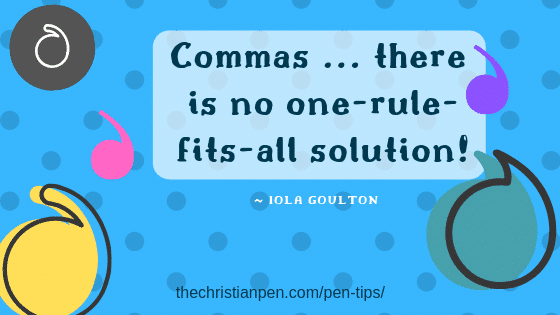 Iola Goulton of Christian Editing Services is a New Zealand-based freelance editor specializing in Christian fiction. Iola holds a degree in marketing and has been editing since 2012. She is a member of the Christian PEN, and Romance Writers of New Zealand, and manages the Beyond the Borders zone of American Christian Fiction Writers. When she’s not working, Iola is usually reading, writing her next book review, or avoiding working on her first novel. Iola lives in the beautiful Bay of Plenty in New Zealand with her husband, two teenagers, and one cat. Website: http://www.christianediting.co.nz/ or follow her on Facebook, Pinterest, Twitter. Dear Editor: Will You Review My Book on Amazon? I often find my clients ask questions that go beyond editing or proofreading. I see from the various editor groups I’m involved in that I’m not the only one hearing these questions. Today I’m going to offer my answer to one of the questions I often hear. I hope it will help you if you’re asked the same question. Will you review my book on Amazon? Many of my clients are self-published authors. Savvy self-published authors know Amazon reviews are important. Reviews offer social proof, especially for new or unknown authors. After all, who is going to buy a book from an unknown author without checking out the reviews? Almost no one. That’s why authors ask everyone they know to review their book. As an editor, you’re either a business associate or an employee of the content creator (aka author). 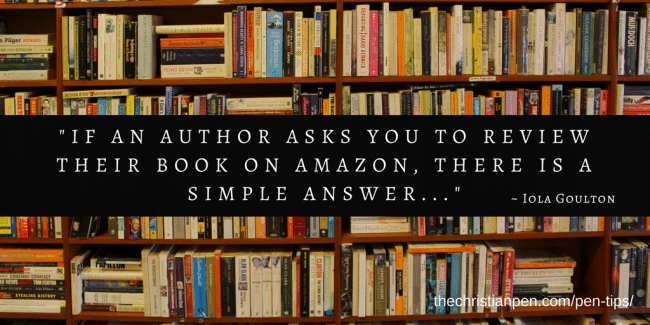 So if an author asks you to review their book on Amazon, there is a simple answer. You can’t, because it’s prohibited by Amazon’s reviewing guidelines. What About Other Retail Sites? All online retail sites have rules about who can and can’t leave a review. Most sites have similar rules to Amazon, in that they do not permit authors, publishers, or anyone else associated with the production of a book to review that book. Review the book on your own blog or website. Review the book on sites which do permit reviews from content creators, such as Goodreads. Mention the book in your client newsletter. Mention the book on social media e.g. retweet the author’s posts about the book. Note that Federal Trade Commission Guidelines Concerning the Use of Endorsements and Testimonials in Advertising require you disclose any financial relationship, whether you review the book or simply mention it. Have you been asked to review books by clients? How have you responded? 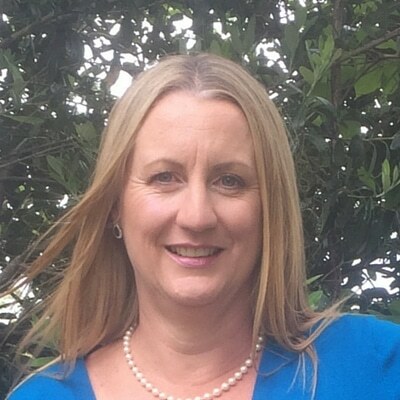 Iola Goulton is a New Zealand-based freelance editor specializing in Christian fiction for adults and young adults. Iola holds a degree in marketing, and has a background in human resource consulting. She has been editing since 2012, and is a member of the Christian PEN, American Christian Fiction Writers, and Romance Writers of New Zealand. When she’s not working, Iola is usually reading, writing her next book review, or avoiding working on her first novel. Iola lives in the beautiful Bay of Plenty in New Zealand with her husband, two teenagers, and one cat.